Friends, creators, Art and Soulies, you have Sarah Gibson’s Red Girl to thank for the existence of one-on-one Creativity Coaching sessions. quite form a picture of how a one-on-one session would look. Would I be able to help? It was a privilege to hold the space for Sarah to paint out her grief. I was so moved by our first session, that I went straight out into the park and cried. Tears of sorrow for her. Tears of joy for me. (Have I ever told you that, Sarah?) I felt totally in the right place at the right time. I was doing the work I was meant to do. Very soon, maybe in the third session, Red Girl tumbled out of Sarah’s brush onto the large sheet of paper, into the world. And the rest is history. 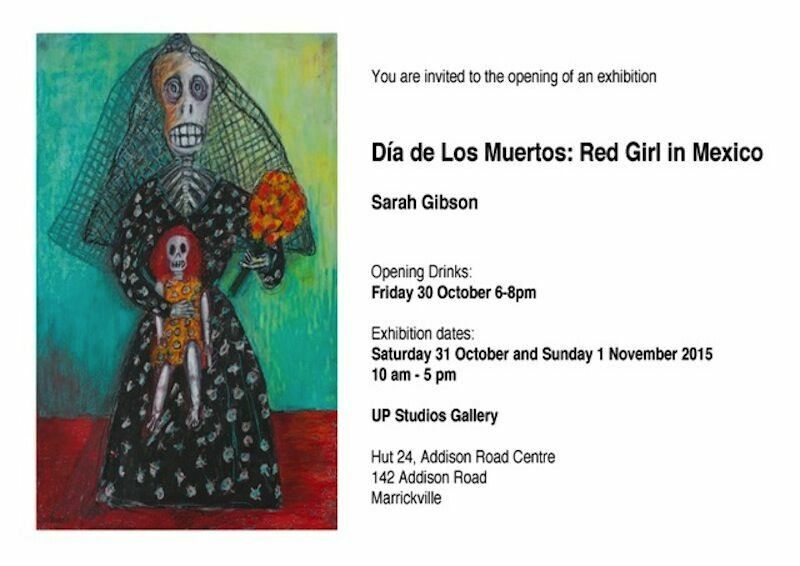 Sarah is about to hold her first ever solo exhibition. Red Girl is the star. She’s specially written this piece below about her creative process for Art and Soulie Spot. Enjoy. Relish. And get along to her show if you can. It’s in Sydney; Friday 30th opening drinks, then Saturday 31st October and Sunday 1st November. but my secret desire was to paint. I had no formal art school training. I’d learnt filmmaking on the run and through women’s film workshops. I had taken courses in printmaking and sculpture but I longed for a more immediate way to express my feelings and ideas. Frustrated by all the steps between a creative idea and the final image, involving so many technical processes, money and people, I craved something more spontaneous and personal. 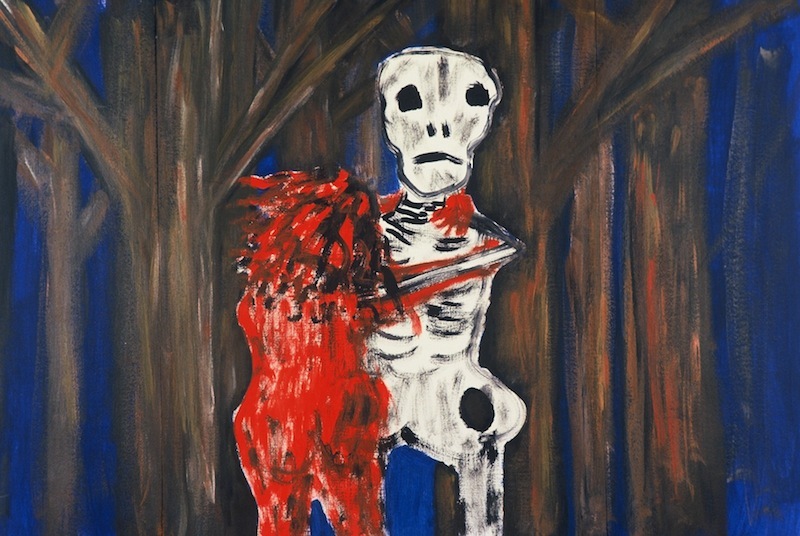 After my partner died in 1998 I sought out support from Sally (Art and Soul) to express my grief using paint. I started with large swirls on paper. Shapes would emerge and with them image stories of my chaotic emotional inner world. It was through this process with acrylic paint that ‘Red Girl’ emerged. She became my guide through the landscape of grief. Red Girl drowned, was stuck in a pit, nailed to the floor, burnt alive and re-emerged through her night sea journey with hope. As a psychotherapist I wasn’t frightened by what emerged, rather I valued these images as the outward expression of my inner psychological process of healing. In my film The Hundredth Room I used over 100 of these acrylic paintings and some became animations. What I discovered from that process helped me in my next creative work. Alongside writing and developing my interactive fairy tale project Re-enchantment I painted. For a long time I painted forests- bare blue and red trees, dark and submerged dense threatening trees. Later, these paintings became part of the visual design of the project. Painting allowed Red Girl to connect me to the world of fairy tales and imagination. She/l knew about the dark mother of the Hansel and Gretel story. Oddly my established “filmmaker” identity did not help me feel legitimate as an “artist”. It was a major breakthrough for me to attend art classes, painting summer schools, drawing workshops and artist trips. I have had some great teachers who have encouraged my expressive painting and drawing. 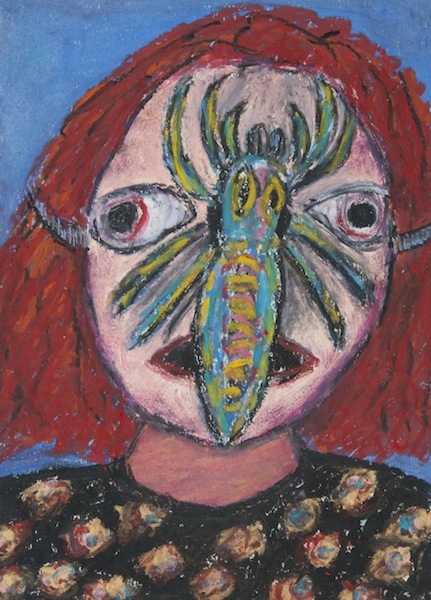 Though for a long time I hid my desire to paint self portraits and Red Girl, but now she is going public. In the last few years I have undertaken several Artist Residencies, spending a month doing art as a way of travel- Beijing, Oaxaca Mexico, and very recently Morocco. They led me to sublet my own studio space, such an important step in developing the work for my upcoming first solo exhibition Red Girl in Mexico. 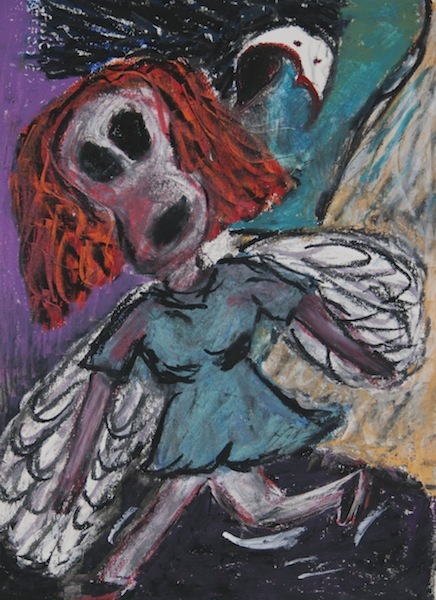 I have used my experience of Day of the Dead celebrations in Mexico to develop a series of oil pastels drawings where in self portraits and Red Girl images I explore my anxiety about death and my fear of my unlived life. I begin each day in the studio with a “process drawing” in a visual diary. It may be a dark smudge or words and images, whatever I feel, have experienced that day or it could be a Red Girl image. I write in my journal. Then I move into work on a drawing. 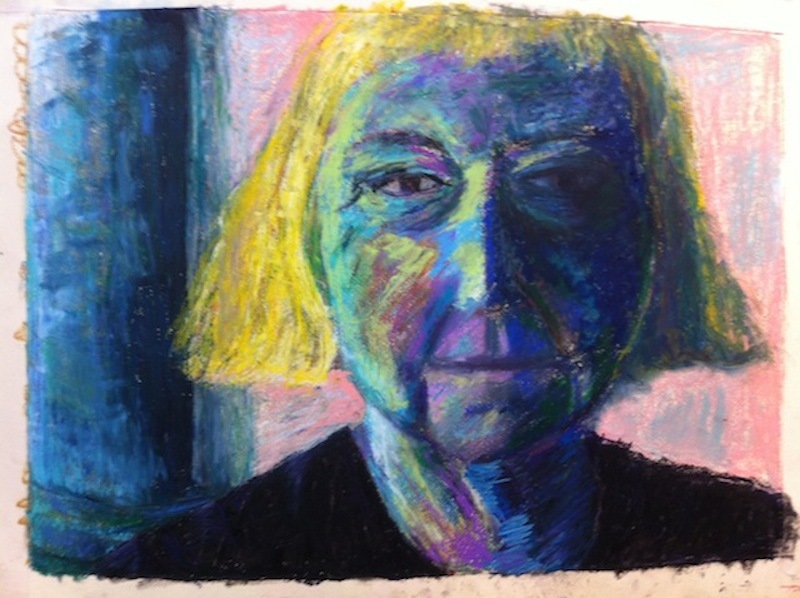 Sometimes these have begun in a drawing class, sometimes they are new images or self portraits. I try to have several on the go. Oil pastels are a more recent medium for me. I love their intense colours, the thick painterly feel and the way I can layer colour, scratch into, rub back, create and destroy. I love working large. What I know from my early work with Sally and my studio practice today is that creative process is about tackling fear. I now accept this is part of the process. I regularly meet with a group of women artists for mutual support. I have made myself enter drawing competitions to put my work ‘out there’. I am currently working on a self-published book ‘Red Girl in Morocco’ and in 2016 I want my own studio and to enter a self portrait into the Portia Geach competition. You might check out www.resartis.org – a worldwide network of artist residencies. 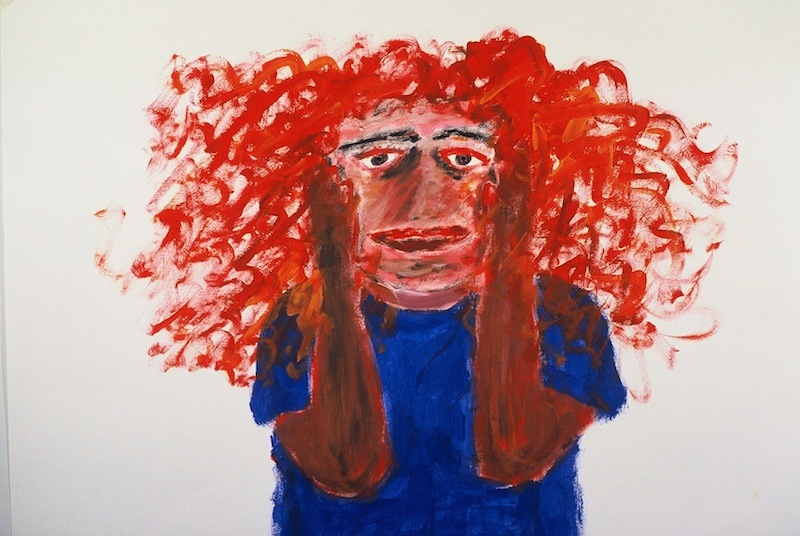 This entry was posted in Art and Soulie Spot, Art as therapy, Art of Grieving, Creative Process, Stories from the Creative Path and tagged artist identity, artist residency, Creativity Coaching, exhibiting, painting, Red Girl, Sarah Gibson by Art and Soul Space. Bookmark the permalink.